Delicious recipes. Mostly Raw Vegan. If you know me you know that I love bananas. I also love coconut cream. I always have a stash of Trader Joe’s coconut cream in the cupboard. I little while ago Trader Joe’s was out-of-stock and I almost went crazy! Well, not quite but close. I would like to share one of my favorite recipe that is really easy to make and is guaranteed to please your guests for any occasion. If you are not vegan, you can use real whipped cream too. This will save you a trip to Trader Joe’s. Before there were prescriptions and over-the-counter medicines, herbs and spices were the foundation of traditional medicine practices around the world. Fast-forward thousands of years, and researchers today are now taking a fresh look at the potential in these natural remedies. The Indian spice turmeric is right at the top of the list. The healthful properties of turmeric and ginger are just now beginning to emerge in the West. 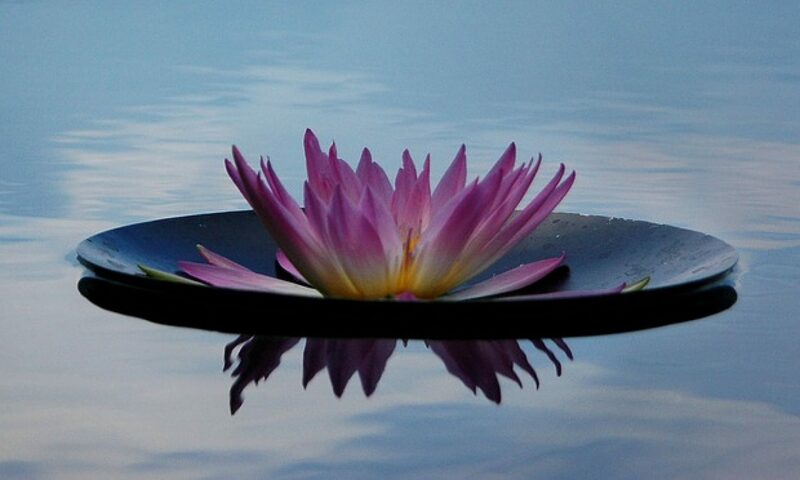 Asian cultures have used these herbs for millennia, not only for their flavor but for their medicinal power. Everyone likes a warm drink on a cold day. Rather than imbibing on a cup of sugar or caffeine, you can enjoy something that will not only give you that warm, fuzzy feeling but will help your body as well. The rhizomes of turmeric and ginger are used in cooking and teas and as supplements. 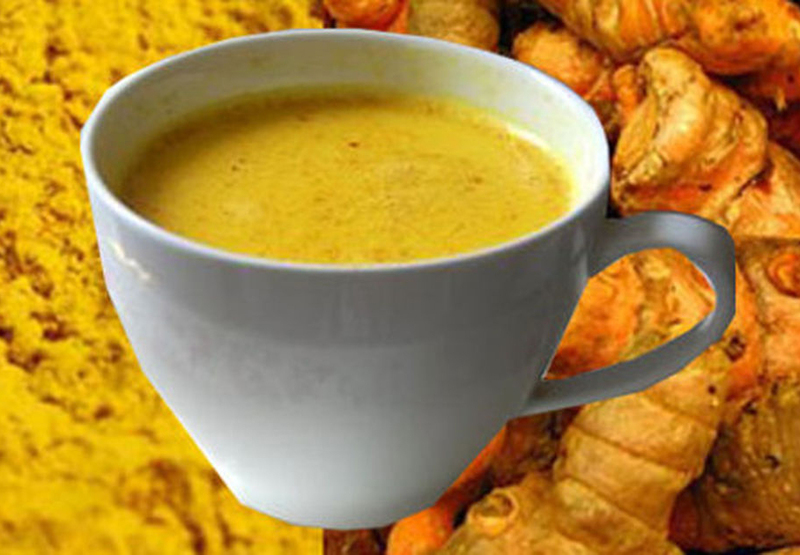 Turmeric is known for its deep yellow color and is what makes golden milk golden. A common herb used in curry, turmeric has a little bite to its otherwise rich, metallic taste. 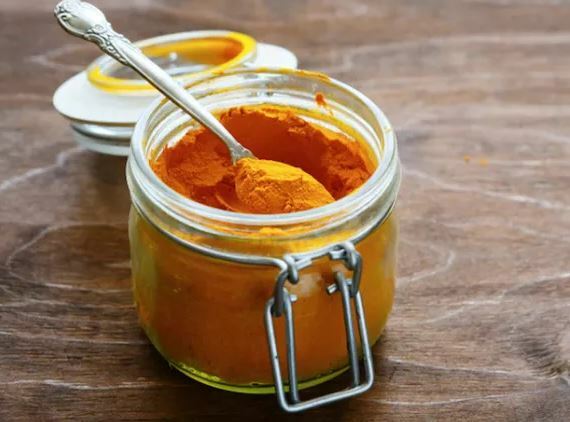 The curcumin in turmeric has been shown to reduce blood pressure , perform better than Prozac at treating depression, and protect the body from various toxins. It also is an anti-inflammatory and antioxidant. Sounds very much like a superfood. Ginger could be referred to as a super herb. Whether used to aid digestion, as a detoxifier or to fight cancer, ginger also has a flavor kick that adds depth. Raw ginger is carried by most large markets and will keep for a long time if kept cool and dry. Fresh turmeric is more difficult to find but health and Asian markets carry it, more so in the winter months. Either in its powdered form is a viable second choice. Honey is a superfood whose benefits for human health are too numerous to list here. With antioxidant and antibacterial properties, it is used in this recipe because it is a healthy sweetener. When turmeric and ginger are mixed with coconut oil, they become more readily absorbed by the body (one of the important features of healthy saturated fats). Combined with piperine found in black pepper, absorption of the curcumin in turmeric is increased exponentially. All that being said, here is a recipe for a delicious drink that will warm and nourish your body. Cook all ingredients together in a small saucepan over medium heat. Stir well until the mixture thickens—it doesn’t take long. 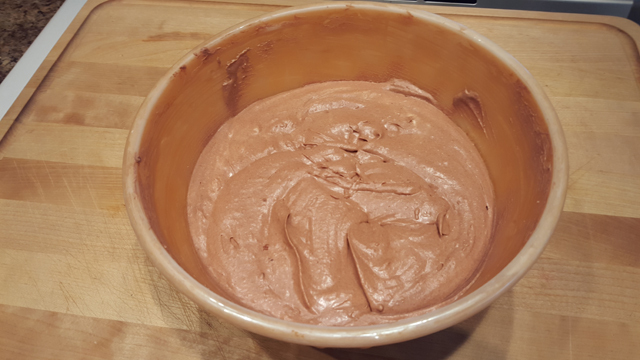 When a paste has formed, remove from heat and allow to cool. Combine all ingredients except honey in a small saucepan. Cook on medium heat, stirring constantly. When completely blended and hot (but not boiling), remove from heat and add honey to taste, stirring until dissolved. Would you like more recipes like this one? This was a nice treat for New Year’s Eve. 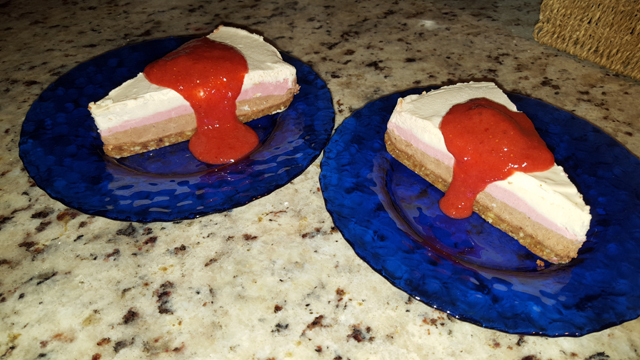 I had saved a few pieces of Neapolitan raw cheesecake I had made for a dinner I had with friends the week before. I wanted to save these pieces to end the year with a Bang! 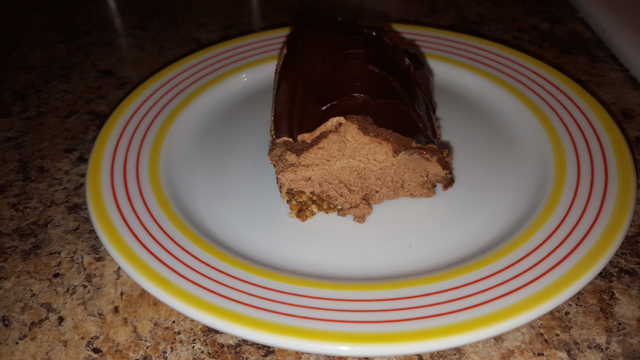 This raw cheesecake is so good and smooth that it is a great alternative to the lactose version. It is pretty easy to make and a little more time consuming if you make it in 3 colors, but it is worth it. 1. Place the nuts in the food processor and pulse to chop until the large pieces are broken down. 2. Add the dates, sea salt and vanilla and pulse to chop until it starts to stick together. (It is preferable to have a finer crust than a chunky one). If you find it hard to get it to stick together, just add a few drop of water as you pulse and it should do the trick. 3. In a 9″ spring-form pan place in the bottom a cut round wax paper. This will help avoid your crust to stick to the bottom of your pan. 4. Scoop out the mixture and evenly tap it in the bottom of the pan. Place it in the freezer. 1. Warm coconut oil and honey in a small saucepan over really low heat until liquid. 2. In the most powerful food processor/blender you own (if you have a Vitamix or Blendtec, use that) place all liquid ingredients (melted coconut oil, honey, lemon juice, vanilla) and mix well. 3. Drain and rinse the cashews and gradually add them to the liquid. 4. After you have mixed it well and you get a homogeneous mixture, you should have a little over 5 cups of thick liquid. you now have to separate it in 3. 2 cups for the vanilla part, 2 cups for the chocolate part and 1+ cup for the strawberry part. 5. 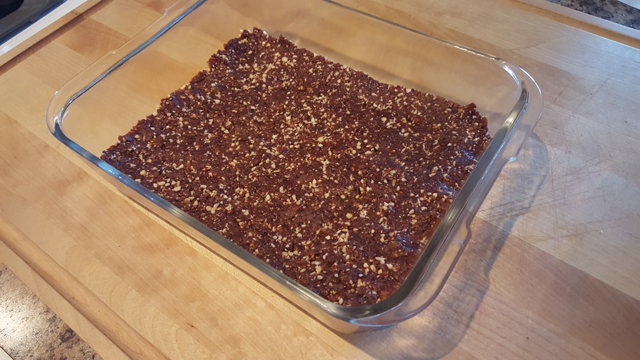 Mix the sifted cacao with 2 cups of the mixture and pour it on top of the crust and place it back in the freezer for it to harden a little. 6. Mix the melted or fresh strawberries with the 1+ cup of the mixture until smooth. Pour on top of the chocolate mixture. 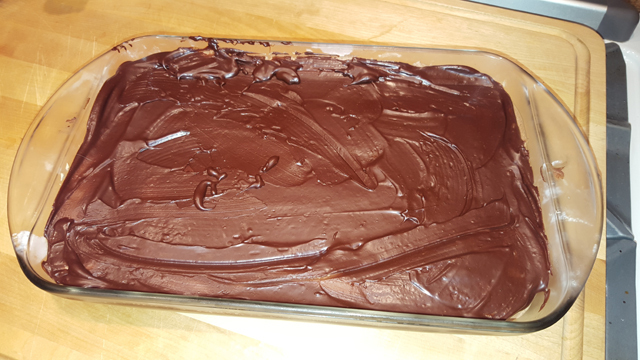 You might have to wait until the chocolate part in the freezer has hardened a little. Then pour the remaining vanilla mixture on top of the strawberry and place in the freezer until solid. Remove the raw cheesecake from the freezer at least 30 minutes before serving. Run a smooth, sharp knife under hot water and cut into slices. Serve on its own, or with fresh fruit or make a strawberry coulis by melting 2 cups of strawberries and mix it in the blender until smooth and pour on top of the cut pieces. If you find it too bitter, you can add some sweetener. Store leftovers in the freezer (if any). Rich, succulent and melting in your mouth is the best way to describe this recipe. I was out for dinner a few weeks ago and I ordered a dessert and got really surprised with the taste and the texture. I had to ask the server what were the ingredients of this amazing dessert. The one that gave me an Ah Ah moment was the full-fat coconut cream… When I heard it, I say “Of course!” and it gave me the idea to create this dessert. I am sure you will love it and don’t be shy to share it with your friends and family. 1. 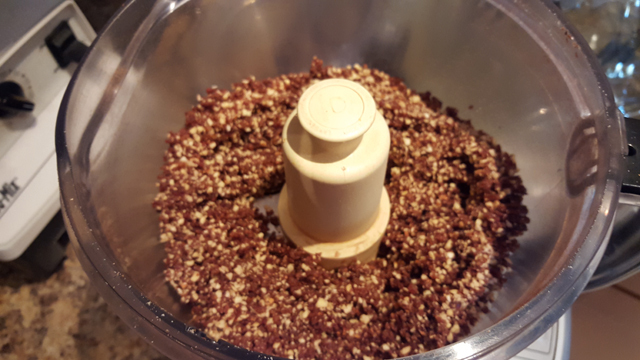 Place the nuts, raisins, and dates in a food processor and mix well until the mixture stick together. 3. Press the crust in the bottom of a 9 in x 9 in or equivalent glass pan. 1. Pour the 2 cans of coconut cream into a large bowl. 2. Mix well with a hand mixer until you get a soft mixture. 3. Add the vanilla and maple syrup. 4. Add the cacao powder slowly and keep mixing as you do so. 5. Keep mixing until you get a smooth uniform mixture. 6. Pour the mixture on top of the crust and place in the freezer. 1. 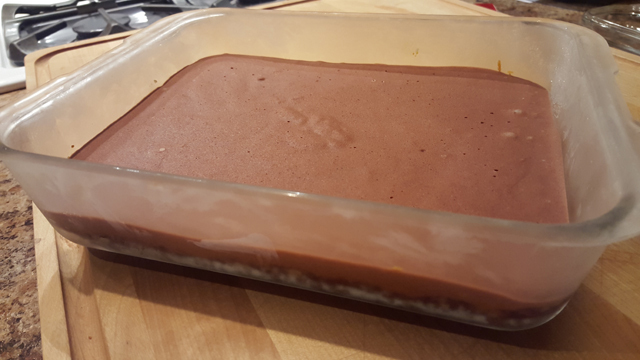 Mix the coconut oil, maple syrup and cacao powder until uniformly mixed. 2. 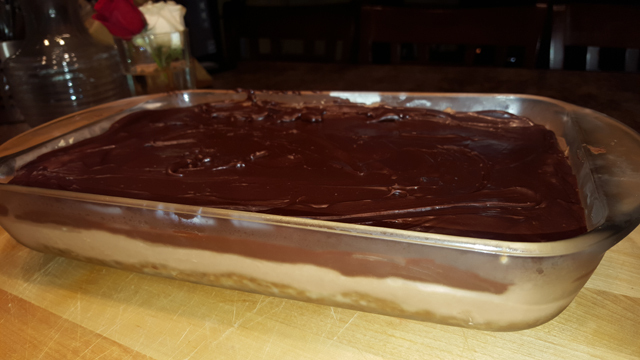 Once the filling is frozen, pour the chocolate mixture on top of it and spread uniformly. 3. Put back in the freezer. Remove from the freezer 20-30 minutes before serving. 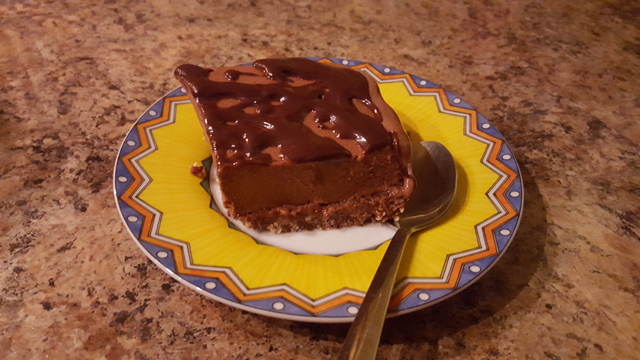 I have been eating and making raw vegan desserts for about 5 years. After making many recipes and experimenting with my own creation, I have to say that I now have more successes than failures. Yeah! One of my successes was last night. 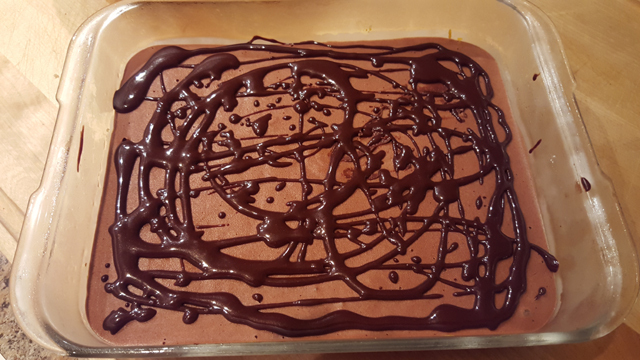 I invited my neighbor for dinner and I know that she loves Orange-Chocolate treats. 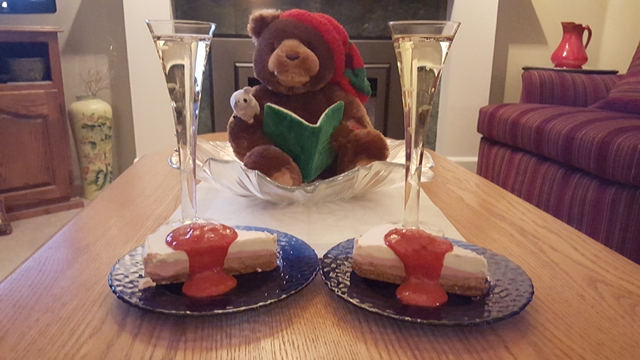 Therefore in her honor, I created this amazing and light dessert. 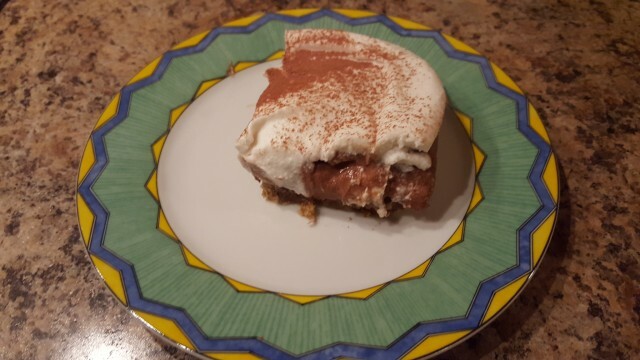 I say light because instead of using nuts for the filling I used frozen bananas. It worked out really nicely and no added sugar necessary. Try this one out during the holiday and you will amaze your friends. 1. Place the almonds and Medjool dates in a food processor and mix well until the mixture sticks together. 2. Mix in the cacao powder. 4. Sprinkle the orange zest onto the lightly press crust. 1. Place the bananas in a Vitamix mixer (if you don’t have a Vitamix, let the bananas melt to soften them) and mix them until they are all crumbled. 2. Pour in the orange juice, coconut oil, and mix until you get a uniform mixture. 4. 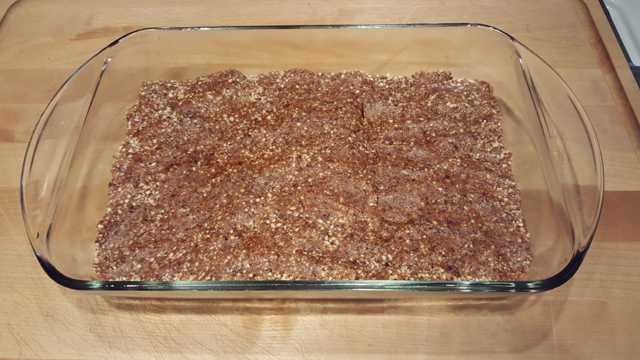 Pour the banana mixture on top of the crust and place in the freezer. Pull out of the freezer 15 minutes before serving.